Siobhain spoke about the Ahmadiyya and Tamil communities on International Human Rights Day.She described their historic and continued suffering, and called on the government’s moral responsibility to ensure justice for human rights abuses and freedom of religious expression. You can watch her speech online (15:53), or read it below. ‘Thank you Madam Deputy Speaker. Today on International Human Rights Day, I want to focus my attention on two communities that are at the heart of my constituency: the Ahmadiyya and Tamil communities. The borough of Merton is the UK, and worldwide, headquarters for the Ahmadi Muslim Community, which makes an incredible contribution to the richness and diversity of our community. This includes the Baitul Futuh Mosque in Morden, which is the largest Mosque in Western Europe. 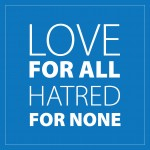 Britain’s Ahmadiyya Muslims contribute greatly to this country, and their belief in peace and religious tolerance is an example to us all, as you would expect from a community whose motto is “Love for All, Hatred for None”. However, in Pakistan this very same, peaceful community continues to be persecuted on a daily basis. It is the only religious community to be targeted by the state on the grounds of faith. In Pakistan, Ahmadis cannot call themselves Muslims and are prohibited by law to vote as Muslims. This state-sponsored persecution has been enshrined into the country’s constitution since 1974. On top of this, they are openly declared ‘deserving to be killed’, with neither the state nor civic society willing to stand up for Ahmadis against extremists. Perpetrators are given free rein to attack Ahmadis, safe in the knowledge that they won’t be prosecuted for their actions. And in the last few years alone, hundreds of Ahmadis have been murdered. It is quite shocking to think that the persecution this community faces is enshrined in Pakistani law. It is a criminal offence, punishable by imprisonment, a fine or even death, for an Ahmadi to call themselves Muslim, refer to their faith as Islam, call their place of worship a Mosque, or say the Islamic greeting ‘Peace be upon you’. This is a clear denial of basic human rights for Ahmadi Muslims to freely profess and practise their faith without state interference or persecution. And these laws specifically against the Ahmadi Muslims also conflict with the constitutional right of Pakistani citizens to have freedom of religion. The state’s laws have therefore emboldened other state actors and extremists to harass, attack and kill Ahmadis. They are denied the right to life. Hundreds have been murdered on the grounds of their faith. The deadliest attack on the community occurred in 2010 when the Pakistani Taliban attacked worshippers during Friday prayers at two Ahmadi mosques in Lahore. In 2014 alone, eleven Ahmadis were killed solely because of their faith. And this year, a vigilante mob targeted an Ahmadi family in Gujranwala, setting their home alight and killing three family members, a grandmother and her two little grandchildren. No arrests have been made, and Pakistani news channels refused to air bulletins about the incident. They are denied the right to vote. Ahmadis are disenfranchised unless they declare themselves as non-Muslims, and are the only disenfranchised group in Pakistan. And they are denied the right to worship. Many Ahmadi Muslim mosques across the country have been sealed and minarets have been demolished by police under pressure from extremists. In May of this year, the district court in Chakwal ordered for the minarets and arch of the local Ahmadiyya mosque to be destroyed. Furthermore, they are also denied dignity in death, as their graves are vandalised, with any reference to Islam removed. It is crucial to note that no prosecutions have been brought in relation to these murders, nor indeed in respect of any of the killings against Ahmadi Muslims. Civic society fairs little better. The Pakistani Urdu press continues to publish fabricated stories inciting violence towards Ahmadis, who are often presented as the root cause of problems in Pakistan. In 2014, at least two thousand such reports were published. Furthermore, Article 20 of Pakistan’s constitution guarantees freedom of religion, and the country is also a signatory to the UN Charter of Human Rights, which makes it obligatory for the government to safeguard the fundamental rights of all without any discrimination based on religion, faith or belief. But it is clear that Pakistan is systematically failing to uphold the human rights of all its citizens. The ongoing persecution of Ahmadi citizens undermines Pakistan’s progress and its development, and stores up huge problems for the future stability of the country. Furthermore, the state’s policies allow extremism to flourish, which threatens the security of Pakistan itself and the rest of the world. What is also clear is that the international community has a moral responsibility to act and apply pressure on Pakistan to abide by international conventions and treaties in order uphold the human rights of all. And on this point, I hope that the UK government will be inspired by this debate today to reflect on its current stance on the issues I have described. It should consider what further steps it will take to ensure Ahmadis have the right to vote in Pakistan. It should think about how it will guarantee that UK taxpayers’ money will not be used to promote intolerance and extremism in Pakistan. And it should decide how it will raise the specific issue of anti-Ahmadi laws and corruption that allow extremists to target and murder Ahmadis. Very sadly, Pakistan is not the only country where we have to be watchful of violated human rights, and reflect on the UK’s moral responsibility. I have written to the Foreign and Commonwealth Office about my concerns regarding the release of UK government funds to Sri Lanka, and have previously raised the ongoing inadequacy of justice mechanisms. In Sri Lanka, it is the Tamil community that has suffered greatly. This group continues to be the victim of ongoing security sector human rights abuses. And despite the recent change of government in Sri Lanka, which may offer some hope, the charity Freedom from Torture has received seven referrals for people tortured in the country since the January elections, as recently as July 2015. Consider the significance of this evidence when compared to the UK’s seemingly unwavering confidence in the new Sri Lankan administration. This confidence has been expressed in terms of financial support, with our government providing funds from UK taxpayers to, in part, fund ‘military reform’ in Sri Lanka, without any proper safeguards as to how this money will be spent. Six years after the end of the brutal civil war, not one person has been prosecuted for war crimes, despite the fact that forty thousand Tamils died in the final stages of war alone. Furthermore, contemporary evidence of secret torture camps, sexual violence against Tamil war widows, and the militarisation of Tamil lands demonstrates that the UK government’s optimism is unfounded, and its financial support questionable without explicit safeguards.